Trying to find the source of a water issue, a slowly leaking pipe, bad flashing or mold? We can help. All too often a water stain is an unknown factor, don’t let it remain that way. can tell a lot about the wall, ceiling or floor that concerns you. 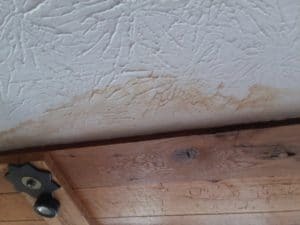 Because moisture can travel distances inside a structure before showing its presence it may need multiple techniques using different pieces of equipment as well as Inspecting attics or crawl spaces to make a determination. If we are conducting a Home Inspection for you and you have moisture concerns, just let us know about them and we will make sure they are addressed, using moisture meters, infrared or mold testing. If you just want a specialist Inspection for moisture we will just charge you for a one hour consultation.